Have you been smooched yet? This is our entry for both Athena's Caturday Art blog hop, and the #PBSG #52Snapshots of Life photo challenge (hosted by The Lazy Pit Bull), with LOVE being the theme for this week. Truffles could not possibly be loved any more than she already is! Aww... That's so sweet. It makes me so happy when I see how much my furiends are loved. Happy Valentine's Day! Yup, I already got a smoochie. Happy Valentine's Day! My mom is always being smooched by some fur in the family. Happy Valentines Day! Beautiful! Happy Valentine's Day!! Hope its filled with lots of love and kisses!! What a beautiful Valentines Card! Happy Valentines Day to yous too! Cute! And, ooh...NASCAR! Cool! Happy Hearts Day! Happy Valentine's Day to your whole family! Our boys will gladly plant a few smoochies of Truffles. Happy V Day! Happy Valentine's Day beautiful Truffles! Happy Valentine’s Day to you and Truffles. Happy Valentines Day! Great art! Happy Valentine's Day to you and Mom Melissa! What a sweet Valentine's Caturday Art! 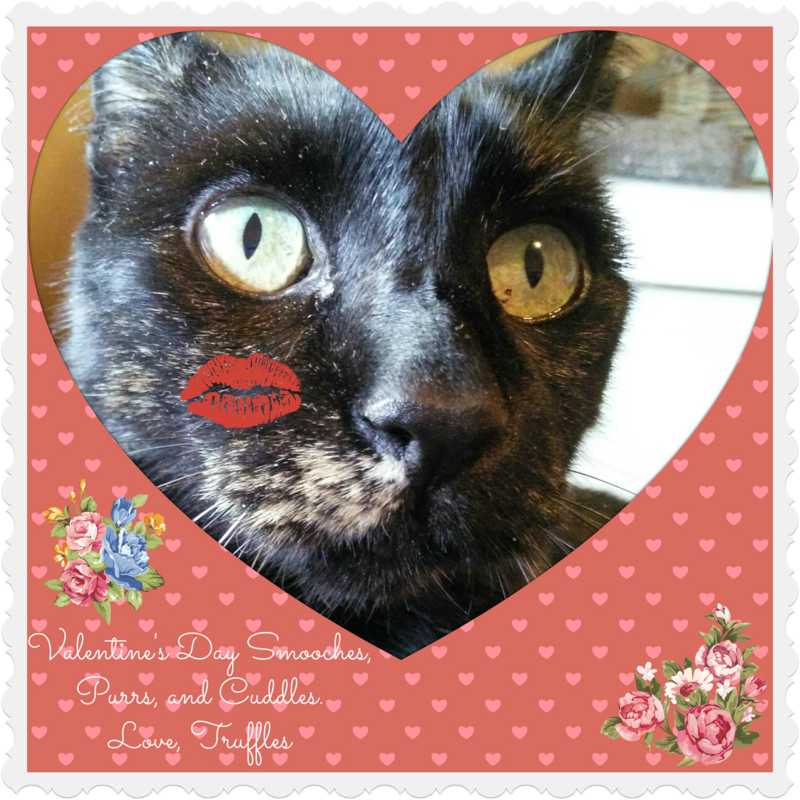 Happy Valentine's Day to you Truffles and to your Mom too! Truffles you are sooooo sweet!!! Hope you had a wonderful Valentine's day! Very funny and cute idea for Valentine's Day - hope it was lovely for you!